Let’s be honest… you need more than 36 hours to truly explore and experience Copenhagen. But, if you’ve only got a weekend and you found return flights for under £20 (thank you, Ryan Air! ), at least your short time in this thriving city will give you a taste of what to expect when you come back. Because you will be back. If it’s Saturday evening and you’ve just landed in Copenhagen, what do you do? Make sure you have booked somewhere for dinner. Michelin-starred restaurants like Kadeau, noma, formel B are booked out months in advance, but you can probably still get a table at Höst , PONY or The Standard. We enjoyed a delicious à la carte menu at Uformel (formel B’s cool and edgy younger brother), sampling smoked mackerel, fallow deer with pickled chicory, and tartar of beef. After dinner, we treated ourselves to a few drinks at a nearby bar and retreated to back to our own hostel bar for a nightcap before bed. We stayed at the Copenhagen Downtown Hostel for two nights. It was centrally located, had comfortable beds and shared dorms, clean amenities and a great bar and hang out area down stairs. The free WiFi and cool but cosy atmosphere were an added bonus! On our first (and only) morning in Copenhagen we sampled brunch and strolled through the foggy streets into the shopping district. Copenhagen is a beautiful city, easily enjoyed on foot and by boat. Its idyllic harbours and canals are best seen from the water and can be explored by guided tour boats that departure from Nyhavn or Gammel Strand. Nyhavn (New Harbour) is a 17th-century waterfront, canal and entertainment district in Copenhagen, Denmark. The brightly coloured houses, restaurants, cafes and bars that line the harbour date back to 1681 and many of the houses lining the quays of Nyhavn have been the homes of prominent artists. Hans Christian Andersen lived in two houses here, including No. 67 between 1845 and 1864. Nyhavn is a perfect spot to enjoy a morning coffee or beer overlooking the water and locals go about their everyday lives. In cooler weather many will still sit outdoors with a beer and a blanket over their legs, provided by the restaurant on each seat. A boat tour around the harbour will give you a glimpse of the Copenhagen Opera House, Amalienborg Palace, Christiansborg Palace, the impressive Black Diamond Library, and, of course, the Little Mermaid. The Little Mermaid is located at Langelinje Pier and has become one of Copenhagen’s most iconic landmarks. She is based on Hans Christian Andersen fairytale and on 23 August 2013 she turned 100 years old. From Nyhavn, walk 600m north to Amalienborg Palace, the winter home of the Danish royal family. It was constructed in the 1700’s and consists of four identical classical palace façades with rococo interiors around an octagonal courtyard. 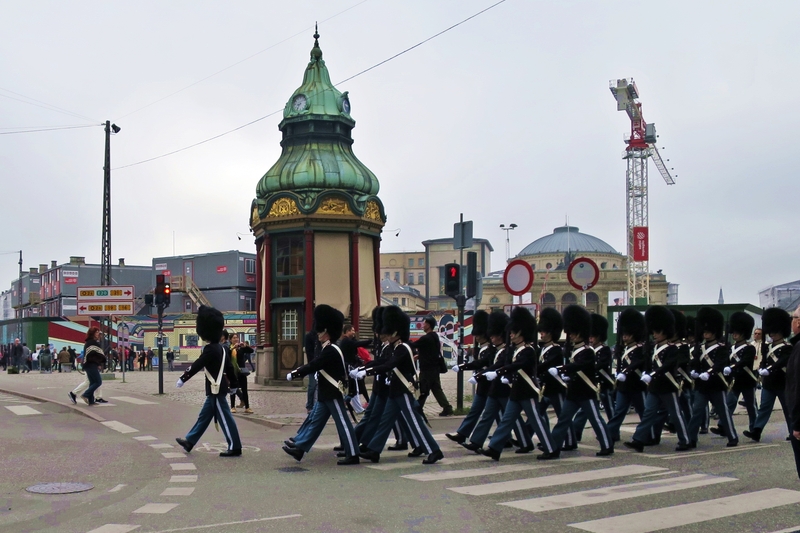 Amalienborg is guarded day and night by Royal Life Guards (Den Kongelige Livgarde) who march from Rosenborg Castle at 11.30 am daily through the streets of Copenhagen and execute the changing of the guard in front of Amalienborg at noon. Amalienborg Museum features Danish history stretching back 150 years to Christian IX and Queen Louise, who were known as “the in-laws of Europe” because four of their children ascended to the thrones of England, Greece, Russia and Denmark respectively. From Amalienborg Palace, walk west along Gothersgade to Rosenborg Castle, built by one of the most famous Scandinavian kings, Christian IV, in the early 17th century. The Dutch Renaissance palace and gardens includes a museum housing the crown jewels, a unique glass collection and portraits of Johan Friedrich Struensee and Queen Caroline Mathilde. A short stroll from Rosenborg is Torvehallerne, a covered market place with over 60 stands selling everything from fresh fish and meat to gourmet chocolate and exotic spices. It’s right by Nørreport Station and features plenty of bars and tables where you can sit to enjoy a quick lunch, early dinner or a glass of wine. After you have feasted at Torvehallerne, head back towards the city centre by walking south east along Frederiksborggade and then Købmagergade, a pedestrian shopping street featuring high-end designers and clothing stores from around the world. Stop at the Rundetårn (The Round Tower), a 17th-century tower built as an astronomical observatory. A 7.5-turn spiral ramp is the only access to the observatory at the top of the tower, and provides access to the Library Hall and the Bell-Ringer’s Loft, both located above the adjoining church. The observation deck is located 34.8 m above street level. On clear days, both the Øresund Bridge and Sweden can be seen in the distance. From The Round Tower, follow the pedestrian shopping street to reach Strøget, Europe’s longest pedestrian street from City Hall Square (Rådhuspladsen) to Kings New Square (Kongens Nytorv) near Nyhavn. Turn right and follow the pedestrian street south west until you reach Rådhuspladsen (City Hall Square). City Hall Square is a public square in the centre of Copenhagen and hosts markets and activities throughout the year. There is also a photo opportunity with a large statue of Author Hans Christian Andersen, a very important part of Danish culture. On the opposite side of H. C. Andersons Boulevard from City Hall Square, is Copenhagen’s famous Tivoli Gardens, a 19th-century amusement park with antique roller coaster and live entertainment program. It is open throughout the year from April to September. From central Copenhagen, cross the Københavns Havn (river) to explore the charming Christianshavn neighbourhood with canals, houseboats, cobbled streets, colourful houses and old warehouses. There are plenty of small bars and cafe’s you can stop to have a drink or snack in, and you can also visit Freetown Christiania, a self-proclaimed autonomous neighbourhood of about 850 residents, covering 34 hectares. Taking note of the large signs advising us not to take photos, we respectfully entered Freetown Christiania and had a beer in the peaceful beer garden in the middle of the park. I’m going to be honest here; Freetown Christiania is probably the coolest place I’ve ever been to. It was very quiet, relaxed and quite charming. There were masked men (ninjas) selling marijuana and small market stalls selling all kinds of hemp goods and trinkets. They even have their own flag and souvenir shop. After such a long day of walking, you will need to rest and recover with some lovely Danish food! We enjoyed a delicious three-course feast at Cofoco’s restaurant, Höst, in central Copenhagen (close to Torvehallerne). The prices were surprisingly affordable, and the beautifully presented Nordic food was something I will definitely travel back to Copenhagen for. Denmark took the top spot on the United Nation’s World Happiness Report, 2013 & 2014 and came in third in the 2015 report, following closely behind Switzerland and Iceland. This is probably influenced by their great work-life balance, the average 37 hour work week, and the extensive government support offered to families with children and family-friendly workplace practices. But it could also be due to hygge. It is possible that hygge is the reason why the Danes are the happiest people in the world. There is no direct translation for hygge, but the closest word to describe it might be “cosy”. Hygge is to create well-being, connection and warmth. A feeling of belonging to the moment and to each other. Celebrating the everyday. Snuggling up on the couch with a good book. Playing with puppies. Savouring a hot chocolate with marshmellows in front of a warm fire. Hygge is best used during the Danish winters, which are long and dark. Tivoli Gardens and the streets of Copenhagen are filled with candles and lights and mulled wine (known as gløgg) during the festive season. Along with their famous Christmas Markets, perhaps winter is the best time to experience hygge and Copenhagen? You can still experience hygge in the summer months in Denmark with picnics in the park, barbeques with friends, outdoor concerts, street festivals and bike rides, especially when done the Danish way! Thanks to the lovely ladies that I visited Copenhagen with, I feel that hygge was well and truly achieved. I hope you also have a wonderful time exploring the capital of Denmark! Ranked as the world’s best restaurant in 2010, 2011, 2012 and 2014, noma is still in the top three in 2015, and holds two stars in Guide Michelin Nordic Cities 2015. Located in a renovated harbour-front warehouse in Christianshavn, noma’s setting complements Chef Rene Redzepi’s excellent in Scandinavian cuisine. PONY is the baby brother of Michelin-starred restaurant Kadeau and is well-known for its delicious food. The Standard includes Almanak and Studio (Havnegade 44, 1058 København K) Claus Meyer from noma, Meyers Madhus and jazz musician Niels Lan Doky have joined forces to open a combined restaurant and jazz club. Here you can enjoy both Nordic and Indian food while listening to soothing jazz tones. Metro and trains also run frequently from outside Terminal 3. A taxi into the city centre will cost approximately DKK 250-300 (£25-£30). Check out my recommendations on what to do in: Amsterdam, Bali, Berlin, Brisbane, Budapest, Cambridge, Canberra, Cappadocia, Chamonix, Copenhagen, Dubrovnik, Istanbul, Kotor, Kyoto, London, Madrid, New York City, Paris, Riga, Scotland, Tokyo, and Washington D.C.